Częstochowa for many years has been attracting millions of pilgrims not only from Poland but also from around the world. The Pauline Fathers Monastery is not only a place closely related to the history of Poland but also where you can see one of the most famous sacral paintings The Black Madonna. Jasna Góra is a sanctuary situated on a limestone hill one of the most prominent places of Marian cult. The origins of the sanctuary date back to the 14th century. Popes, kings, aristocrats, statesmen, and representatives of all social strata came to Częstochowa for prayer. Jasna Góra is also a place that has witnessed many historical events such as the Swedish Deluge. At present, around 5 million people come to Jasna Gora. Undoubtedly, the image of Our Lady of Czestochowa is one of the most recognizable symbols of Christianity. A trip to this place for many tourists is an essential part of their stay in Krakow. The distance that divides the monastery from the city is less than 130 km. 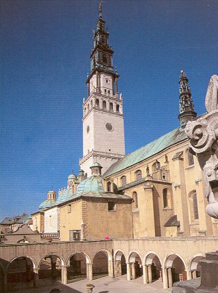 We offer the tour to Częstochowa in the PRIVATE TOUR option. We created this option to satisfy the most demanding of tourists. In addition to choosing the start and end times of the trip, a private comfort-class car with a private driver, the undoubted advantage of this version is the opportunity to visit Jasna Góra with a private guide in a previously chosen language. In this case, please make a reservation at least two days in advance. Only then we can guarantee full flexibility due to the ever rising interest in the Sanctuary of Jasna Góra. In the Sanctuary, there are no requirements regarding the size of the luggage that you can carry with you. However, we recommend that you leave it in our office or in the car so that it doesn't bother you during the visit. At the client's request, the company can rent for the duration of the visit a sachet for handy things. After sightseeing, free time is available.